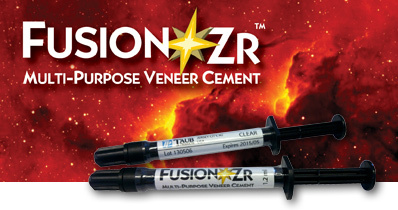 FUSION-Zr™ is a self-adhesive, light cure veneer cement and is indicated for the adhesive cementation of all-ceramic restorations, Lithium Disilicate and CAD/CAM type materials, where light curing is desired. SPEED-SET - Highly light sensitive, cures completely and fast. 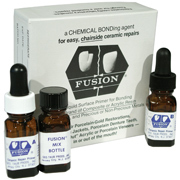 FUSION-Zr™ Can be used on all porcelain crowns. ULTRA GRIP PLACEMENT gives FUSION-Zr™ a unique stay-put viscosity that holds veneers in place. Self-Adhesive: Bonding agents can be used. Bonding agents are not required. 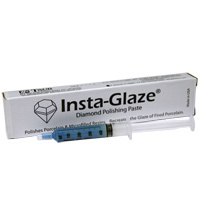 FUSION-Zr™ is available in Crystal Clear shade for Accurate Visualization and Opal White shade for Natural Brightness. Corresponding try-in gels of the same colors are also available. An indirect approach to direct composite resin veneers. Dental Economics, FUSION-Zr Resin Cements (Ross Nash / Debra Engelhardt-Nash). 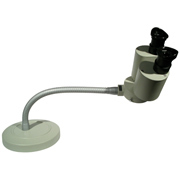 This Componeer case shows the use of bonding agent One Coat 7.0 from Coltene before the use of FUSION-Zr as this is a Coltene sponsored article. Dr. Ross Nash outlines how he enhanced one patient's smile with a minimally invasive technique. 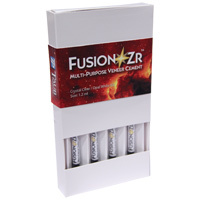 FUSION-Zr Veneer Cement Kit - New White (More Opaque) - 2pk: Item # 06-5030 (2x 1.2ml New White Syringe, 10x Applicator Tips) This cement is less translucent then the Opal White and helps opaque background. Naturally bright optics by Olympus.